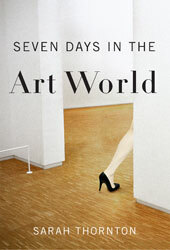 I just read Seven Days in the Art World by Sarah Thornton and found it both a fascinating read and food for thought. She describes her writing as ethnography, "a genre of writing with roots in anthropology that aims to generate holistic descriptions of social and cultural worlds." The book is made up of seven chapters, one for each day: The Auction (Christie's in New York), The Crit (Michael Asher's Crit Class at CalArts), The Fair (Art Basel), The Prize (The Tate's Turner Prize), The Magazine (Art Forum), The Studio Visit (Takashi Murakami's studio in Japan), and Biennale (the Venice Biennale). Prior interviews and research make rich and detailed portraits within the compelling storytelling format of the one day. I read The Prize chapter at the beach and was so caught up in the drama of which of the four nominees Yoko Ono would announce as the winner that I didn't notice the incoming tide until I was wet. I have been an artist for a long time but the "art world" has always been a very separate one from mine. I have always had mixed to antagonistic feelings toward it from afar. Some of those feelings I am sure come from the fact that it is a world that I don't feel welcome in, but some are also basic to my world view. I have always felt that the art world is too elite and too much about money. I've concluded that a big part of the reason is the fact that artists traditionally make their livings (or not) by making and selling one-of-a-kind works which therefore must be expensive. Paintings and sculptures are sold to people who can afford them, which by and large (Herb and Dorothy Vogel and others excepted) are people with money. Reading Seven Days in the Art World did nothing to discourage my opinion of the art world being very much about money, but it did make me feel much more kindly to it. I came away from the book believing that most of the people in that world are there because they truly love art. I also had a better understanding that my feeling that it is a foreign land is not just about the money. There is some underlying conceptual, intellectual thought structure about the approach to art in that world that I can't put words to but I know is different from mine. For a long time, I thought that being an artist meant aspiring to be part of that world. I no longer think so. I am happy with the work I do. I think it has a directness and emotional resonance that may be because it doesn't have that underlying conceptual base that I can't verbalize. As I say in the promotional material for my Artist's Journey talk: "I believe that the only work you can do better than any one else is that which is truly your own." And I do believe that I do work which is truly my own. The challenge of all artists is to make the work and then take that work into the world. For some, it will be the high powered, high stakes "art world" with all its competition and challenges. For others like me, it will be a different path filled with challenges of its own. More food for thought. Susan: Thanks for this insight--it is something that I can truly relate to my own work. Perhaps it would be helpful for those of us who don't consider ourselves part of THE art world, to think about the concepts of art worlds--plural, ever widening ripples on a pond that connect in some ways but are also unique as circles. Many thanks for the thoughts. Susan, your art is such an inspiration, y'know your Spirit Books CD with the high resolution images & all the details of how you made each of the books is a treasure in my home. X fingers that one day I will be in a city where they are on show in an exhibition. That series is your major work in this lifetime (so far) & really does need to be housed in a major collection, does the Center for Book Arts in NYC acquire work? the next question is would you part with them? All my best work has been sold over the years (or given to Old Man Crow (my partner) so I have some pieces in house for reference that I can't sell!) Developing a good relationship with a gallery owner who will act on your behalf takes a lot of the stress out of the art making. Most artists are not good business people that is why we need galleries! The gallery owner becomes a friend and a respectful relationship develops from both sides that with luck can last a lifetime. A lot of galleries would want your work so (if you haven't yet) pick one that feels right and never ever sell yourself short! I sell my work for a price that I feel comfortable with, that honours the work and the years that it has taken to develop & oh yes, the work with the most heart and soul that has taken everything I know and a bit more to make always sells, that's what art is! & as Kiki Smith said, the good thing about being an artist is "the work has to go away!" after completing a coursework masters (and I'm now almost to the end of a research masters too) I'm more convinced than ever before that 'THE' art world (eg the one where you get your 'ed-u-kashun' and where all the money, prestige, talk, and beautiful people hang out) is a vacuous, hideous blight on human culture --- it is the land of anti-art..... of anti-thought... of russian drug lords as art patrons and public museums held ransom by rich patrons. but I DO have hope that the real world is turning - that folk are noticing that the emperor has no clothes - and they are demanding a change. Artists books are the best way to reach a much wider audience than the galleries can ever hope for. You are doing a great job and I love how you share so generously! When I was knocked back for a juried artists books show early last year one of the guest speakers Peter Lyssiotis helped me get over my disappointment by saying he had first started making his artist's books over 30 years ago because none of the commerial galleries would show his work! Wow. More food for thought from all. Sharon, I like your idea of art worlds plural and circles and I do think they are growing. Amy, thanks for your kind words. Ronni, your words make me glad all my viewing of THE art world has been from the outside. And I do think there is hope if not for its overthrow then for the thriving of other communities and worlds as Sharon says. And Mo, where to begin. You have hit at the heart of a lot of what I have been thinking about and which I hope will be part of future blog posts. I am pretty much committed to being a non-selling artist. I just shipped 11 of the Spirit Books to Cleveland for an exhibit in October and am putting together a traveling exhibit of 16 which if all goes well with the Cleveland one (safe shipping, etc) I will start to promote later in the year. I think they are more powerful in a group and I would rather have them be seen by as many people as possible than be in a collection somewhere. I'm working on a budget. Although I don't care about making money, I need it to not cost me. As I said, there'll be more on this topic and more about artists books as well. I always appreciate your insights.